Dinosaur Comics - March 12th, 2015 - awesome fun times! –I'm going to get lots of other people to write it for me! 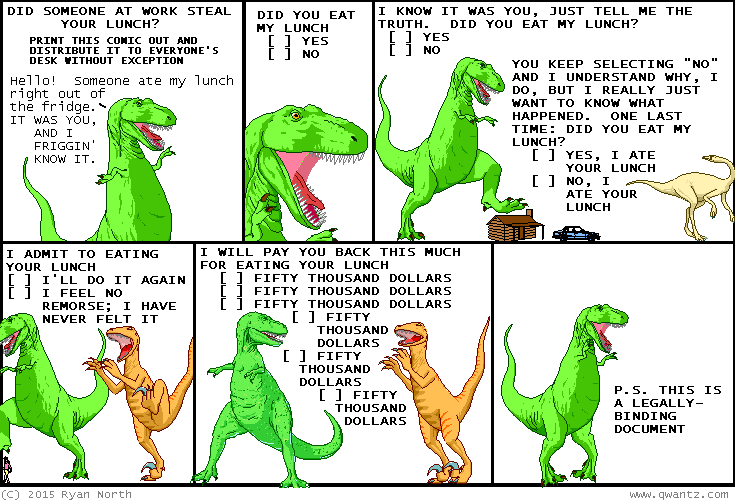 March 12th, 2015: This comic might not apply to everyone, but if you're reading this at 12:01 pm after discovering your lunch is gone: friend, have I got a comic for you!! One year ago today: i've learned about international copyright treaties all i can stands, cuz i can't stands n'more!